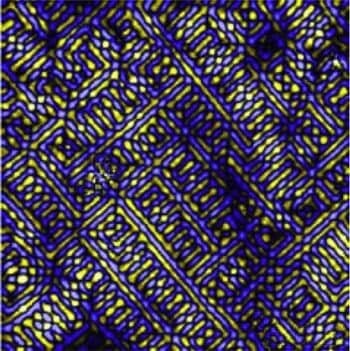 High-temperature superconductors exhibit a frustratingly varied catalog of odd behavior, such as electrons that arrange themselves into stripes or refuse to arrange themselves symmetrically around atoms. Now two physicists propose that such behaviors – and superconductivity itself – can all be traced to a single starting point, and they explain why there are so many variations. The oddities, known as intertwined ordered phases, seem to interfere with superconductivity. “We now have a simple way to understand how they are created and hopefully this understanding will help us to know how to get rid of them,” said Lee. “[Our work] was not random; we were trying to map out all the known phenomena,” Davis said. Most subatomic particles have a tiny magnetic field – a property physicists call “spin” – and electrical resistance happens when the fields of electrons carrying current interact with those of surrounding atoms. Two electrons can join like two bar magnets, the north pole of one clamping to the south pole of the other, and this “Cooper pair” is magnetically neutral and can move without resistance. Lee and Davis propose that this “antiferromagnetic” interaction is the universal cause not only for superconductivity but also for all the observed intertwined ordering. They show how their “unified” theory can predict the phenomena observed in copper-based, iron-based and so-called “heavy fermion” materials.